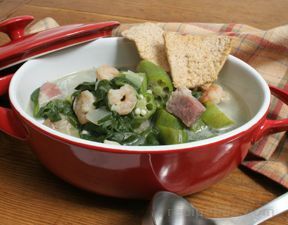 You're going to love the flavor of this great tasting soup featuring nutritious taro leaves, which are known as "callaloo" in Caribbean countries. This soup is great for a light supper. 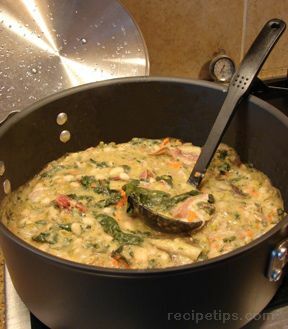 Put the greens into a large heavey saucepan with chicken stock, onion, garlic, scallions, thyme, and salt pork. Cover and cook at a gentle simmer until the pork is tender. Add the shrimp, coconut milk, and okra. Cook until okra is done, about 10 minutes. 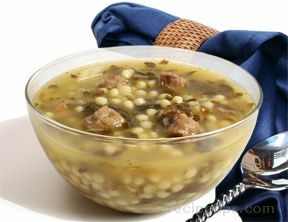 "We tried this soup and absolutely loved it! It's such a great refreshing summer soup and the coconut milk adds a touch of sweetness that counteracts any spice. We have tried it with crab instead of the shrimp and have tried it without seafood as well. Both are also very good. Additionally we found that if you wanted more spice to start with, cooking in a diced jalepeno pepper from the start does well to add an extra kick!"